Brrrr! It is cold out there! 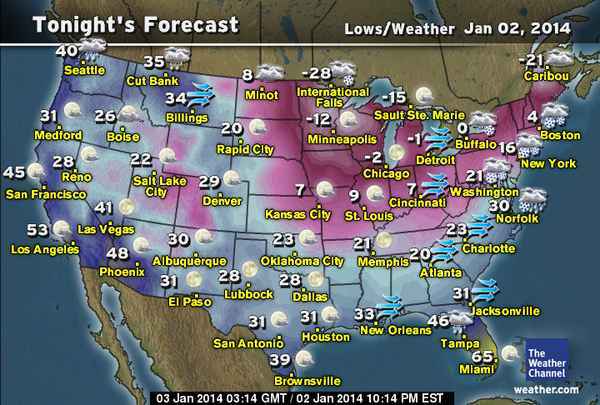 Pretty much everyone in the USA is seeing some extremely low temperatures. Even Miami is only at 65°F according to the Weather Channel, which is quite chilly in a city known for heat. Those of us up here in Michigan and our friends in Wisconsin, Minnesota, and upstate New York would love just to get back into the positive. The best tip available: Keep your cats indoors. Keeping your cat indoors with you is the best way to know that your cats are receiving the same protection from the elements that you are. Keep cats a safe distance from open heat sources. Cats are heat magnets and will get as close to a heat source as they can. To avoid any potential burns, watch cats around open fire places, space heaters, and wood burning stoves. Bang on the car’s hood before you turn the engine on. Even if you keep your cat indoors, there may be a neighbor’s cat or a feral cat who has decided to keep warm under the hood of your car. The fan blade in your engine could cause serious harm or death to any animals tucked away in there. Watch for signs of frostbite. Frostbitten skin will be pale, cold to the touch, lacking sensitivity, and may be glossy. Just like in humans, signs of frostbite will begin at the extremities and areas of the body that are the least insulated (ears, tail, pawpads, etc). This can set in very quickly! The ASPCA estimates that pets can not withstand exposure cold weather for more than 10 or 15 minutes. If your cat gets frostbite, use WARM water (not hot) to warm the area gently and go immediately to the veterinarian. Clean up and properly store antifreeze. Cats like the taste of antifreeze, but it is very toxic to them. If your car leaks antifreeze or you spill any from a container, make sure that it is properly cleaned up. Keep antifreeze bottles tightly closed and stored where cats can’t easily get to them. If you think your cat has ingested any antifreeze, call your veterinarian or the ASPCA’s poison control line right away (888-426-4435). Note that there may be a $65 consultation fee for calling the ASPCA. 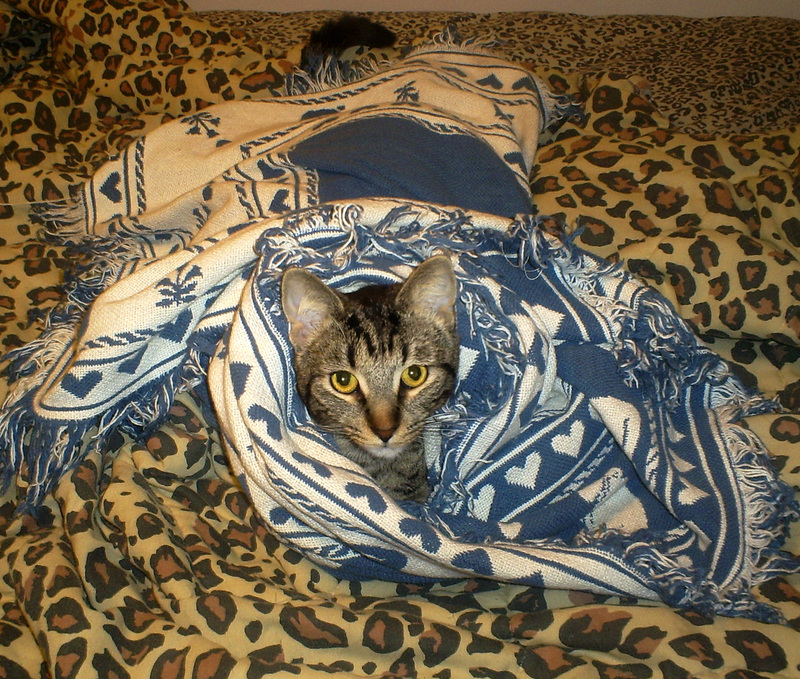 If your cat must go outside, towel off their body when they return indoors. Try to dry them and remove any salt or ice melting chemicals from their paws and belly. You don’t want the cat to clean those things off themselves and ingest potentially dangerous substances! If you bring the cat on a car ride, do not leave them out in the car! We’ve all gotten into a car in the winter and noticed how much it can resemble a refrigerator with seats. It can get really cold, really fast. Don’t take the chance that your kitty will end up with hypothermia or frostbite. If you see any animal cruelty in your area, report it. Neglect is cruelty. Letting an animal freeze to death is cruelty.Most states have laws regarding the proper treatment of animals in cold weather. If a neighbor has left an animal outside in the elements without proper food, water (not frozen), and shelter (large enough to fit in and lay down comfortably but small enough to retain body heat), it counts as cruelty. First try calling your local police and they may be able to offer their assistance or direct you to the proper authority. Another option is to contact your local animal shelter and report the situation to them. Stay safe and warm everybody! Cuddle up with your kitties 🙂 A post on helping feral cats in the winter is underway. Cinco staying warm inside a blanket. Those are such great cold/freezing weather tips. Thank you for sharing. I wouldn’t want to be outside right now so I really don’t want to see critters out there that belong in the house. Thank you. I wouldn’t want to be outside either. I had to go to the grocery store (ran out of toilet paper so I couldn’t put it off) and my face was in a lot of pain from the cold. All I did was walk from the apartment to the car, from the car into the grocery store and the reverse. I can’t imagine what animals left outside are going through in this. My kitties are indoors cuddling with me and my husband. During times of bad weather, especially extreme cold and snow, I am always concerned about the feral cats living outdoors. Though they seem to instinctively know where to go to protect themselves from the heat or cold, providing outdoor shelters is a great way to help them in any weather. Absolutely! I wanted to post about that too, but I felt this particular post got too long for it. I will post about making shelters soon. I have found some really creative shelter building ideas online. I feel bad for those kitties too. They survive this stuff somehow, but it can’t be very comfortable. That’s crazy! We expect that stuff up here, but that has to be a shock to you guys. Hopefully you guys get some relief from the cold soon. We will have to endure it for at least another week. The forecast says that the high temperature here on Tuesday will be 0. Ugh. Maybe one day Allie will decide to come in 🙂 Some people/kitties are just stubborn like that. At least she has your garage to take shelter in. It sounds like your mom loves her a lot. I’m glad to hear that you are staying inside. We are cuddled up inside too. We are doing our best. Brrr! I hope that you are safe and warm as well. Great post and great advice. Our Ali has never been outside. She snuggles with her Daddy at night under the covers and stays plenty warm. Thank you 🙂 My kitties never go outside either. It’s cute that Ali loves her Daddy. What a great way to keep happy and warm! Cinco never leaves my side and Manna likes to snuggle her Daddy. The weather is much better today than it has been all week. The roads are finally doing well enough for kids to go to school today (they’ve had 3 days off because of the weather). I am very happy to be following your blog. I’m always curious about other parts of the world. I’m glad to hear that your weather hasn’t been too bad. Nothing wrong with old, fat kitties 🙂 It just means they’ve had a happy life. Your cat looked snug and warm in that photo! Thanks for sharing your tips. I don’t have a cat but I make sure to pat dry my dog when we go outdoors on our way home, too. It is always best to keep them healthy during winter as much as we do for ourselves, too!